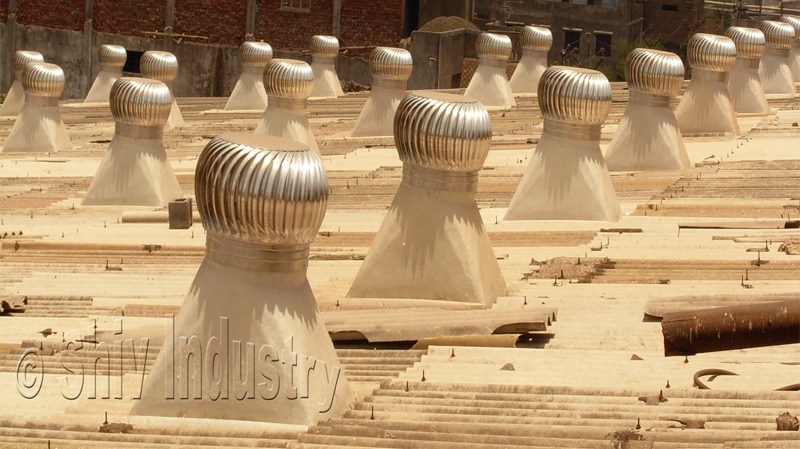 Shiv Industries has mastered the art of manufacturing and exporting FRP Based Turbo Ventilator, which are hugely admired by clients in the domestic as well as international markets. Our Roof Turbo Ventilators are manufactured using Owen Roving Mat, Surface Mat, G.P. Resin, Catalyst and Escalator to match the designing of the roof. As a leading Turbo Ventilator Manufacturer India, we make available Turbo Ventilator with many latest features. Specifications : Total suctions area For the Air ventilator through the F.R.P Base - 1000mm x 600mm Suitable for extreme temperature conditions Accessories are fitted in our ventilators are testes Treated & assembled as per the latest industry standards Aerodynamic vanes of these turbines are manufactured using Aluminum /SS Double curved vanes for assuring maximum weather durability Maximum wind driven efficiency Enhancing performance of exhaust suction No electric power required 80% depreciation under section 32 of IT act Weathered & Storm proof Economical & environmental friendly Teflon Pre sealed or SKF ZZ Bearing Light weight & Durable Virtually Maintenance Free Advantages Complete solutions for the fresh Air ventilation at working area Can reduce the temp by 3 to 7 Degree (as per the earache difference at your works area) Possibility to get the difference 5 to 10 Degree depending on temp difference between ambient & working area No requirement of electrical power as it operates only on wind power Temperate Drop and Energy Saving.